The Huntley Community Association is pleased to bring Zumba® Classes to the HCA Mess Hall! Led by Irina Ionescu, this popular fitness activity should be a great addition to the Huntley Community Association lineup! Looking for a fun way to meet your New Year’s fitness resolution? 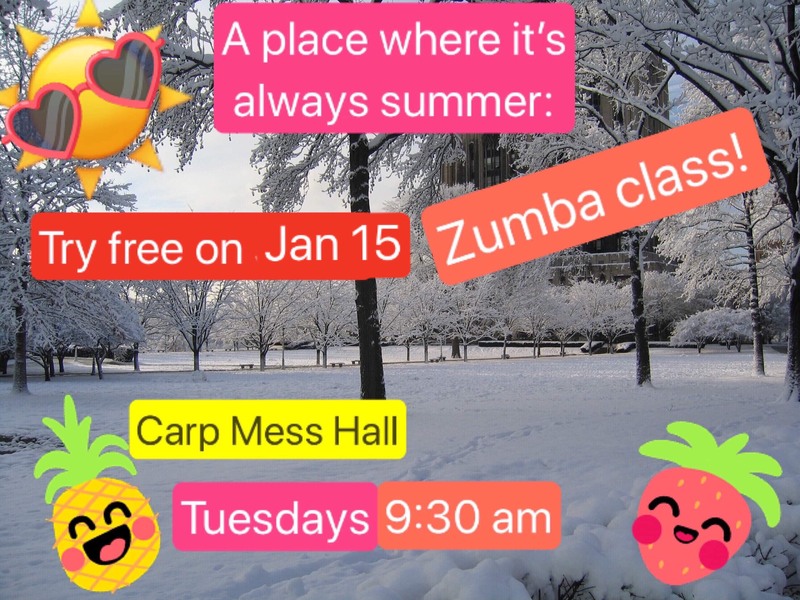 Zumba classes at the Mess Hall will be starting again on Tuesday January 15th, 9:30 am to 10:30 am. No dance experience needed. This is NOT a dance routine. A total workout, combining all elements of fitness – cardio, muscle conditioning, balance and flexibility, boosted energy and a serious dose of ‘awesome’ each time you leave class. Indoor exercise shoes, water bottle, comfortable clothes. The January 15th class is free! The cost for the full session of 10 classes is $75. All sessions are 1 hour long. By cheque, payable to the Huntley Community Association. In person registration on the first Tuesday, if spaces remain.